After watching the trailer for Her, I excitedly turned to the person I was with and said, “That looks good. I wanna watch that!” It was less than three minutes long but it was already able to make me feel a range of emotions. I felt dazzled by the beautiful snippets of a futuristic Los Angeles. The splashes of pinks and reds made me feel giddy. Joaquin Phoenix’s glasses and mustache were endearing (Joaquin Phoenix is just an endearing person overall). Let’s also take a moment to appreciate the use of ‘Avril 14th’ by Aphex Twin. Oh, and the fact that Scarlett Johansson’s voice is super hot was an added bonus. It’s the perfect blend of raspy and seductive. I just knew it was a movie I wanted to see right when it came out. Did it meet my expectations? It did. It definitely did. I’ve seen it three times and am itching to see it again. It’s been nominated for 5 Oscars: Best Motion Picture, Best Original Score, Best Original Song, Best Production Design, and Best Original Screenplay. In my own perfect world, Her would win all of them. That might sound a bit excessive, but I go to the movies quite a bit and it’s not very often that a film is able to make me feel so self-aware. This film is not only important to me as an individual, but to our generation that is thriving in social media. Warning: this ‘review’ will also be an analysis of sorts, so if you haven’t seen Her yet, thou shall not pass! I could blab for hours about this film, so trying to stay concise will be a bit of a challenge. I’ll begin with a point that is portrayed at the beginning of the film: the death of letter writing. 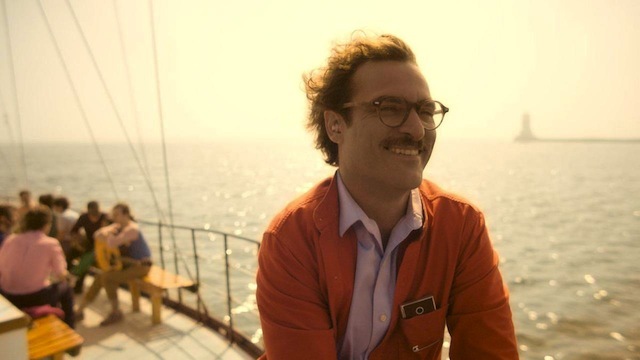 The first image we see is a close-up of Theodore Twombly (Joaquin Phoenix) as he seems to be professing his love to someone. This shot is confusing because he isn’t giving direct eye contact to the camera, or anyone for that matter. His ballad is in the form of a monologue; is he giving a speech? Is he alone? “I can’t believe it’s been 50 years since you’ve married me.” FIFTY YEARS? Wait, what? The camera then cuts to a computer jotting down everything Theodore is saying. He prints the letter and resumes to recite a new letter. The camera pans to reveal a row of cubicles with other employees doing the same thing. The company, Beautiful Handwritten Letters, provides customers with the intimacy letter-writing exudes. This part made me want to bash my head against a wall because it’s a brilliant yet frustrating commentary on the fact that we have the capacity to yearn for intimacy but have lost the ability to express it without the aid of technology and others. I’m not saying that every relationship lacks intimacy, but I think Spike Jones is getting at the idea that too much reliability on social media will cause us to lose interpersonal skills. He does this gracefully by portraying Los Angeles in a believable, very nearby future. He was even able to create his own fashion trend if you think about it. People are PAYING a company to show how much they care about their loved ones, instead of actually taking the time and effort to show their loved ones themselves! And the company is flourishing because of it. Just take a look at Theodore’s apartment. It’s much too big and nice for one person. How can he afford it? By writing letters for other people, that’s how. To be fair, this is the future, and this type of technology is normal for these people. There are only a few book publishing companies left and everything is managed on computers and smart phones on crack. Letter writing depicts thoughtfulness. The act of sending someone a physical letter is way more thoughtful then sending someone a text. Actions speak louder than words. Unless there aren’t any words. Theodore’s marriage with Catherine (Rooney Mara) failed because there was no communication. His flashbacks let us know she was always in his physical presence, but the emotional connection they once had was lost after Theodore stopped sharing his feelings with her. His relationship with Samantha, however, was the complete opposite. He communicated with her almost always, but was not able to share physical intimacy with her (ahem, in the traditional sense at least.) Before falling for Samantha, he is encouraged by her to go on a blind date (Olivia Wilde). They hit it off at a restaurant but when they’re making out outside, Theodore implies that he wants the night to end. Sometimes, there just isn’t a lasting physical or emotional connection at all (which is unfortunate because Olivia Wilde is a babe). I do like that it didn’t work with her though because it shows how the right person has to come along to make you not refer back to your ex relationship. Until that realization, “The past is just a story we tell ourselves.” At one point in Theodore and Samantha’s relationship, Theodore is unable to connect with Samantha. He frantically tries everything he can to reconnect with her, and when he finally does, their conversation leads Samantha to reveal that she has been talking to 8,316 others and is in love with 641 of them. I shared the same incredulous reaction that Theodore produced, but my sister had some interesting insight on the matter. If we go back to the scene when Theodore is eating pizza and people watching with Samantha, he states, “Sometimes I look at people and I make myself try and feel them more than just a random person walking by. I imagine how deeply they’ve fallen in love or how much heartbreak they’ve all been through.” As Samantha is teaching him how to appreciate the little things, Theodore is teaching Samantha how to care about people. It ends up backfiring for Theodore as she evolves, but it goes to show that there are a lot of people out there that we could potentially love. We do not have just one “soulmate”. Even if you don’t end up with your ex wife or your operating system, there are still 600 people that you could end up with. Great! Wonderful! Awesome! There’s hope. Except there are a few moments in the film that make me feel as if someone punched me in the stomach. One is when Theodore states, “I never know what I want. All I do is confuse everyone around me.” An even more painful line is when he says, “Sometimes I think I’ve felt everything I’m ever gonna feel, and from here on out I’m not going to feel anything new…just lesser versions of what I’ve already felt.” Most of us have probably been there, and it’s tough to get out of that funk. Theodore is ultimately able to separate himself with the help ofhis relationship with Samantha, but even that ends. Theodore finally learns that being physically present in someone’s life and communicating with them is key. Inspired by this, he writes a letter to Catherine. His friend Amy (Amy Adams) is left by her OS as well, which allows them to bond with each other outside on the rooftop of their apartment complex. I felt quite dissatisfied towards the ending, but in a good way. I think we are meant to feel this way so that we reflect on our own relationships that we have lost and may potentially lose if we do not change the way we connect with others. Really really can’t wait to see this. It’s not out here in London yet.